Sign up to our mailing list and receive these amazing freebies! Simply click the link for the printable you want to download, and it will be delivered to your inbox right away for FREE! I hope you’ll find them helpful. Enjoy! If you’re wondering where to start your decluttering process, I highly recommend that you start with your bedroom because it’s where you take a rest after a whole day’s work. It’s where you sleep. So it should be calm and relaxing, and that can only happen if you have peaceful surroundings. 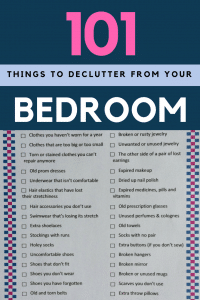 Jumpstart your decluttering with this free checklist- a collection of 101 things that you can declutter from your bedroom today. Are you a messy person struggling to get organized and keep your home clutter-free? Do you crave to declutter but can’t find the time to do so? How about taking only 15 minutes everyday to declutter? Yep! You read that right – 15 minutes only. 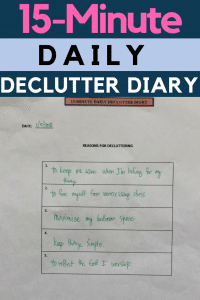 That’s all it takes to build the habit of decluttering. Here’s a 5-page guide to help you get started on the habit of decluttering, monitor your progress and keep you on track. Why stick to it when it just adds to the stress of the day? Your to-do list should lighten you up and help you accomplish each day’s tasks. 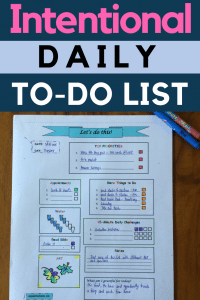 Here’s a simple, intentional and engaging to-do list that will force you to prioritize your tasks and include only those that you will actually do.